In the Greater Mekong region of Asia, which covers Cambodia, Laos, Myanmar, Thailand, Vietnam and the southwestern Chinese province of Yunnan, scientists have recently discovered over 200 new species. The list includes 145 plants, 28 reptiles, 25 fish, 7 amphibians, 2 mammals, and 1 bird. One interesting find is the snub-nosed monkey, which has to keep its head between its knees when it rains so water doesn’t get into its nose. Another noteworthy discovery is a self-cloning lizard, which is an all-female species. As 2010 comes to a close, we thought it would be fun to take a look back at some of the amazing animal discoveries that came to light in the past year. With a leg span of 14 cm (5.5 in. 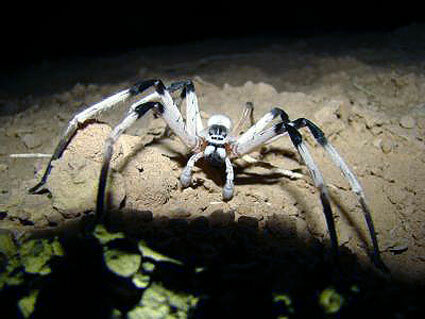 ), a new spider found in the dune of the Sands of Samar in Israel is the largest of its type in the Middle East. In addition, scientists have concluded that Cerbalus aravensis is a nocturnal spider that lives in an underground den with a “lifting door” made of glued sand particles so the den remains camouflaged. Recent exploration by U.S. and Ecuadorian researchers have found more than 30 new species of animals in Ecuador, including the scaly-eyed gecko. 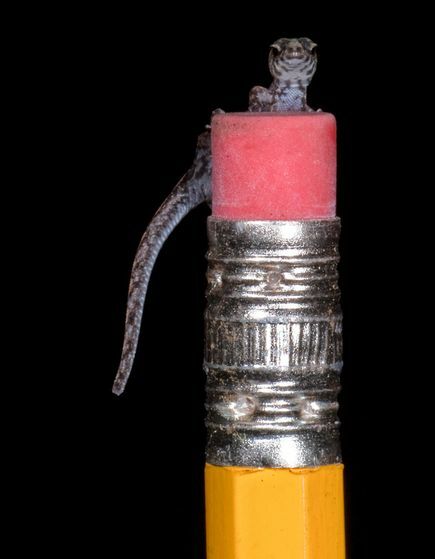 A full-grown scaly-eyed gecko is small enough to sit atop the eraser of a pencil. These geckos crawl along the forest floor, making them difficult to spot. Two groups of researchers using electron microscope technology have determined the true colors of two species of dinosaurs. 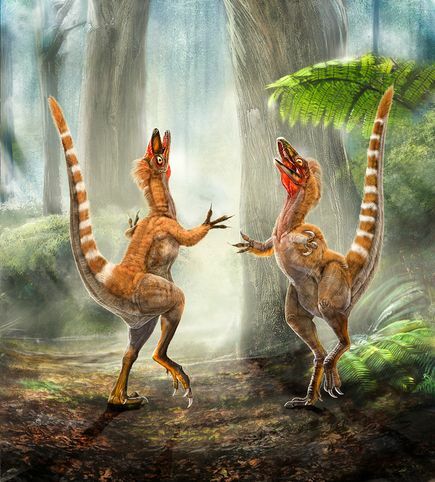 Sinosauropteryx, a turkey-sized carnivorous dinosaur, had reddish-orange feathers and striped tail. Anchiornis huxleyi, a chicken-sized dinosaur, had black and white wings and red crown – similar to some woodpeckers. 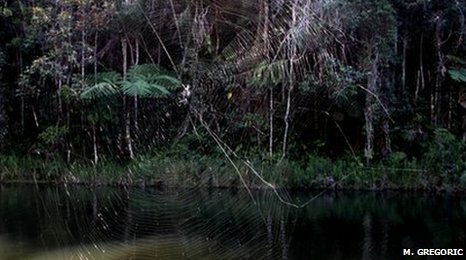 A newly discovered spider in Madagascar builds the longest and largest orb webs in the world. The spider, called Darwin’s bark spider, builds webs over rivers that can measure up to 2.8 square meters (about 30 square feet)! The webs are made of the toughest biomaterial yet discovered and can catch 30 or more insects at any given time. One of the most reclusive primates in the world, the Horton Plains slender loris, has only been spotted four times since 1937. So rare were sightings that researchers thought this loris had gone extinct sometime between sightings in 1939 and 2002. As deforestation has led to a decline in all populations of slender loris, researchers made the effort this year to study the nocturnal primates in their native habitat in Sri Lanka and southern India. This photo was taken as part of the study. Scientists in Peru uncovered the fossils of a Water King, a giant 5-foot penguin that weighed twice as much as an emperor penguin (the world’s largest living penguin) and lived 36 million years ago. 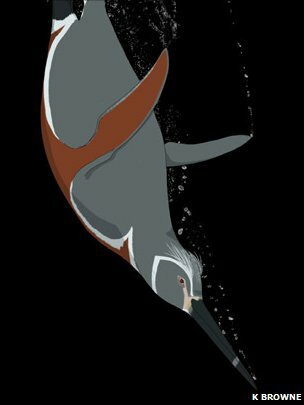 The fossils, which included well-preserved feathers and scales, led scientists to determine that the Water King had brown and gray feathers, unlike the black and white feathers we associate with modern penguins, and it was a very strong swimmer and diver. Discovering a new species of monkey is cool enough, but this species is extra special. Notice anything missing? 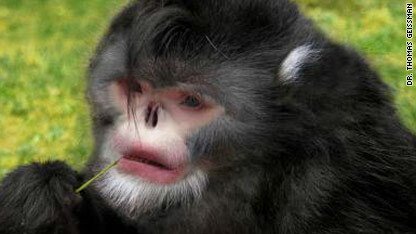 This species of snub-nosed monkey is called Rhinopithecus strykeri and lacks a nose. One problem for the species, primatologists have discovered, is that their noses fill up with water when it rains. this causes the monkeys to sneeze constantly. 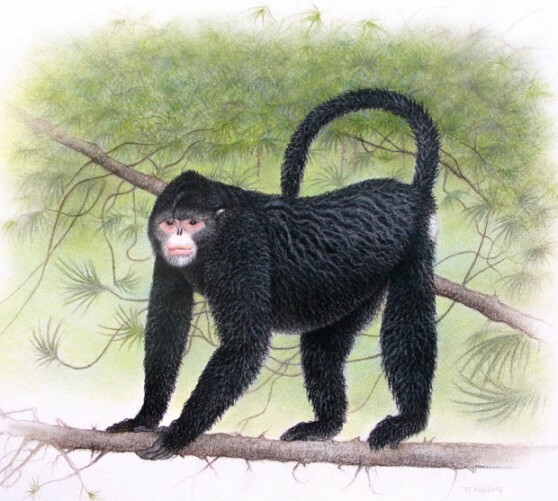 The monkeys were discovered in Northern Myanmar. Researchers from the Durrell Wildlife Conservation Trust, the Natural History Museum, London, Nature Heritage, Jersey, and Conservation International have discovered and identified a new species called Durrell’s vontsira. 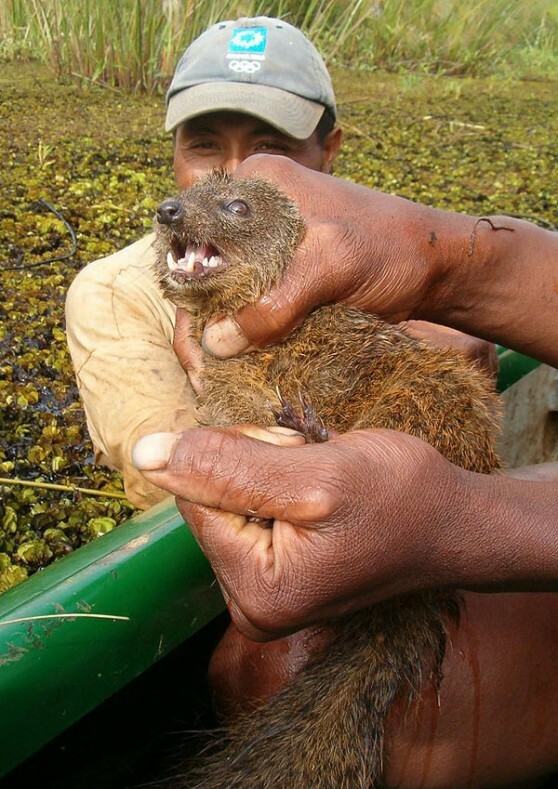 The small, mongoose-like carnivore from Madagascar was first spotted swimming in the Lac Alaotra marshes by Durrell scientists in 2004. 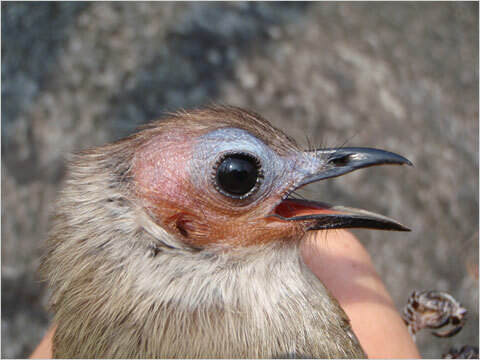 After examining the new find and comparing blood and tissue samples to that of its closest relative, the brown-tailed vontsira, Natural History Museum zoologists noted differences in skull, teeth, and paws. Durrell’s vontsira is specially adapted to an aquatic lifestyle. As the newly discovered vontsira species only inhabits Lac Alaotra, it is especially important to protect those wetlands, which are currently threatened by silting and pollution. Imagine seeing a penguin that’s five feet tall and has a very long, straight beak. Imagine a penguin so large it weighs twice as much as a the Emperor penguin, the largest species on Earth. That is, the largest species on Earth currently. If you were alive thirty-six million years ago you might have seen this giant penguin, called the Water King. Scientists in Peru have recently uncovered the fossils of a Water King, which includes well-preserved feathers and scales. One of the interesting facts discovered is that this species had brown and gray feathers, unlike the black and white we associate with modern penguins. The scientists have also concluded that based on the flipper structure Water Kings were powerful swimmers and their size could indicate that they were able to dive deeply. 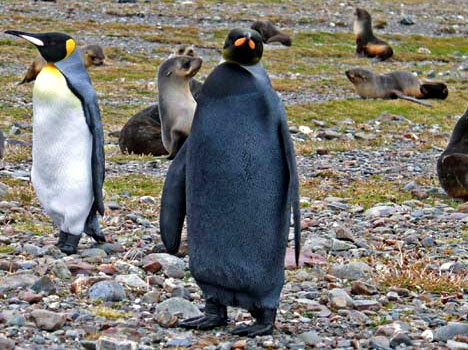 For more on these amazing penguins, visit BBC News. The country of Ecuador is the home to many exciting animals, even ones no one knew existed! Recent exploration by U.S. and Ecuadorian researchers have found more than 30 new species. Among the new species is the scaly-eyed gecko, which, even when full-grown is small enough to sit atop the eraser of a pencil. These geckos crawl along the forest floor, making them difficult to spot. Researchers worry that deforestation and global warming could wipe out many of Ecuador’s unique creatures. 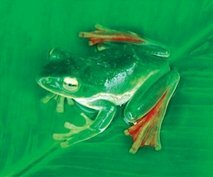 To read more, and to see a complete list of the newly found species (including a frog with see-through skin! ), visit National Geographic.com. With a leg span of 14 cm (5.5 in. ), a new spider found in the dune of the Sands of Samar in Israel is the largest of its type in the Middle East. It was discovered in the southern Arava region in Israel and given the scientific name, Cerbalus aravensis. Although scientists still need to conduct a full study of the creature, they do know that it is a nocturnal spider that lives in an underground den with a “lifting door” made of glued sand particles so the den remains camouflaged. The Israel Land Administration plans to continue mining the Sands of Samar, which will reduce this spider’s habitat and jeopardize its survival. For more information, see NatGeo News Watch. In the last 10 years 353 new species have been discovered in the eastern Himalayas, a mountain range in southern Asia. Among the species discovered are the smallest deer, a tree frog that can glide with its large webbed feet, and a new monkey species. These newly discovered species are at risk, according to the WWF. The region the species were discovered in is at risk of climate change, deforestation, overgrazing, and poaching.